Despite the oppressive heat outside, summer is slowly winding down. The days are getting shorter, the temperature will drop (soon, hopefully) and leaves will turn from green to gold & brown. Which means we’re getting ever-so-close to that holiday that you, faithful reader, love and hold dear. And what better way to ring in the most wonderful time of year then with Alfred A. Knopf’s re-release of Ray Bradbury’s ode to All Hallow’s Eve, The Halloween Tree? Originally published in 1972, Bradbury’s classic children’s tale has become as synonymous with Halloween as A Christmas Carol is with… well, you know. 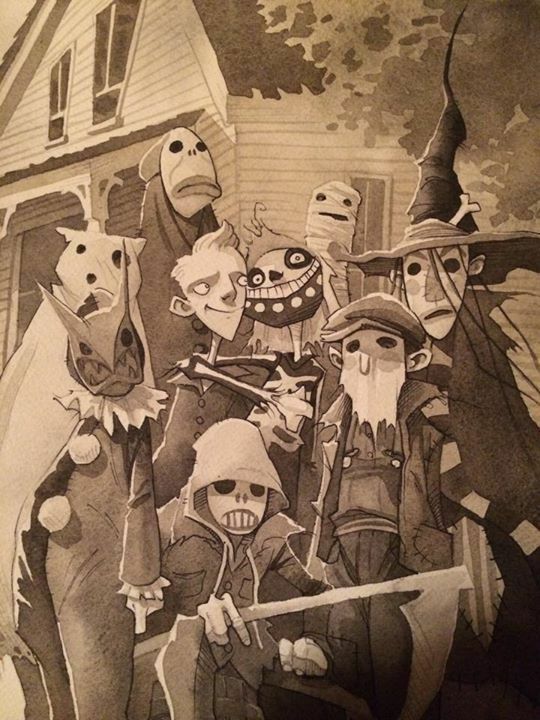 In a small town in a small Midwest state – the details are irrelevant – a group of trick-or-treaters, led by the aptly-named Tom Skelton, are taken through a historical travelogue-through-time by the mysterious Carapace Clavicle Moundshroud to learn about the roots of Halloween’s traditions, as well as to search for their missing friend, Pip. Their search will take them to ancient Egypt, The Notre Dame Cathedral and Mexico for the festivities of Dia De Los Muertos (The Day of the Dead). Bradbury’s prose, nostalgic and poetic, is reason enough on its own to dive into its pages, but it’s the artwork – the beautiful artwork – that will seal the deal. 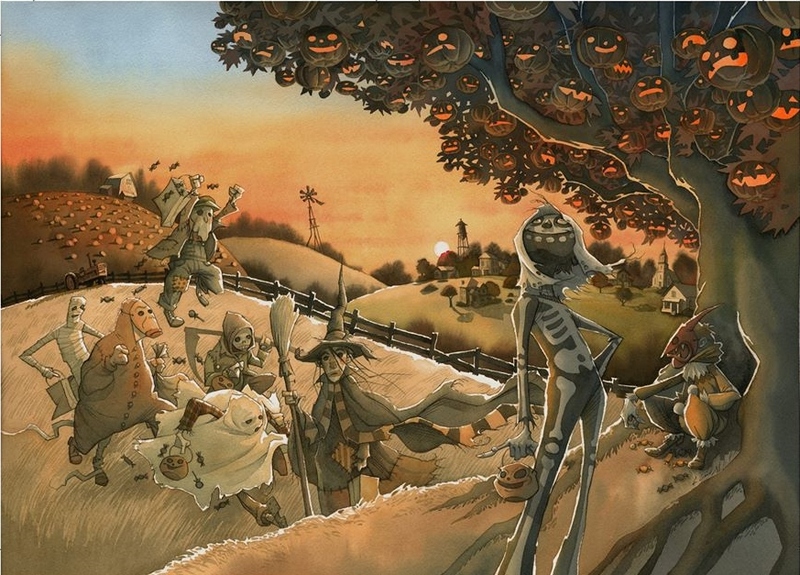 No stranger to the allure of what Bradbury called “The October Country”, renowned artist Gris Grimly provides colour and B&W ilustrations for this rerelease. No stranger to adapting genre classics, having taken his turn at the works of Poe and Mary Shelley’s Frankenstein, Grimly’s sensibilities are a pitch-perfect match for Bradbury’s particularities. The vintage Halloween costumes, airborne waves of freshly-fallen leaves, the pumpkins – so many pumpkins – all rendered in warm gold-and-brown hues, all perfectly capturing the season and the holiday. One can almost smell October itself, coming from between the covers and rising from these pages. As a gateway to the wonderful words of an American literary master or an introduction to one of the finest illustrators working in the field today, The Halloween Tree is the perfect seasonal gift for the young and the young-at-heart. The Halloween Tree is now available for sale at your nearest bookstore, as well as straight from Grimly himself through his Mad Creator Shoppe.